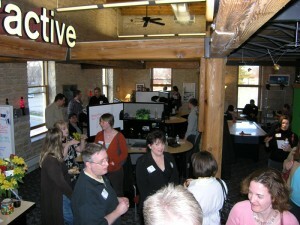 Old met new as Trivera Interactive used Social Media to draw over 60 people from all over Southeastern Wisconsin to a Tweetup at their new office location in Menomonee Falls. Trivera is a marketing firm that helps clients connect with their customers using Internet technology, including Web design, e-commerce, E-mail marketing, Search Engine Optimization and Social Media. Tweetups and Foursquare check-ins represent two of the newest tools in a company's internet marketing strategy. 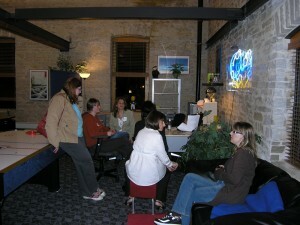 So it seems ironic that the latest in cutting edge marketing and technology would bring so many people to their office in one of the oldest buildings in the area, the restored 119 year old Mill Building in Menomonee Falls Historic Village center. Tweetups are a phenomenon where people who have used Twitter to get to know virtually everything about each others' interests, careers and personal lives online gather to meet face to face, some for the very first time. And when they get there, Foursquare allows them to "check in" at those locations and earn points, badges and other awards for doing so. The most checked in location on Foursquare in Milwaukee is Mitchell International Airport, averaging hundreds of check ins per month. Trivera's event was publicized exclusively on Twitter, with Trivera using Twtvite.com to disseminate the details of the event, allow people to RSVP, and even print out name tags for the event. In turn, fans of Trivera, and the event sponsor/caterer Street-za Pizza, spread the news through their own social networks. Over half the people who came to the Tweetup also checked in on Foursquare, making Trivera a "trending location" on the Foursquare Web site. While Trivera often recommends Tweetups to their clients as a business tool, and has participated in several others' Tweetups, this was the first time they held one for themselves. Trivera's Web development client roster includes dozens of well-known names, including US Cellular, Strattec, Frabill Manufacturing, Regal Ware, Usinger's and Halquist Stone. Trivera also has done Social Media training and strategic planning and execution for Mitchell International Airport, Frank Mayer and Associates, the Metropolitan Builders Association and several political campaigns.